Easy access to all the natural wonders in the Yellowstone area and well-appointed rooms make this hotel a convenient and comfortable option. The IMAX Theater is within walking distance and a close drive away find snowmobiling, cross country trails, fishing and Old Faithful. 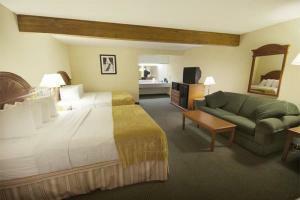 A variety of dining and shopping is nearby in the quaint town of West Yellowstone. Back at the hotel, an outdoor heated pool, hot tub and daily complimentary breakfast are value adds.